Better Surf is a company specializing in fun and exciting ideas. Our mission is to build a unique venue for trend setting surf related products that respect the surf and the creatures within. "My goal is to make and market products for beach lovers. You don't have to be a surfer to love surfing,” says Chalom, Better Surf's Founder. Alan Chalom has been involved in surfing and outrigger canoeing since the time he stood on his first board in Herzlia, Israel (1972). Alan has created a company based on his passions which helps makes you a living, and, in turn, immerses you that much deeper into your own passion. For all those ideas thought of between surf sessions and swells; they now have a home. Alan Chalom has also built the infant and kids line Surfer Baby with the slogan "You're never too young to be cool." Inspired by the beautiful Kalia Sky Chalom, the latest addition to the Chalom family, Surfer Baby offers surfboard bibs and burp cloths, clothing, head wear, and decor that is all surf-inspired. 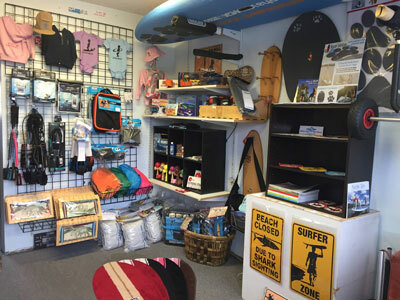 We have a small local shop / showroom located right across from the beach in OB. You can also find us at Aqua Adventures on Mission Bay. There we have most of our Surfer Baby line along with our Paddle Boarding accessories.